For those in search of a little extra comfort, all King rooms are spacious and have a private patio. King bed, AC, cathedral ceiling with sky light, paddle fan, cable TV, rear private patio, bathtub with shower, refrigerator, microwave. Step to grass courtyard and ocean view. WiFi. My husband and I are travel agents with Enchanted Memories Travel in Franklin,MA not too far from Cape Cod. The Inn on the Beach was a great find. 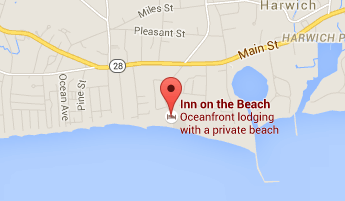 Best location on the beach and short walk to town. Very clean and well kept rooms. Wonderful staff and fantastic breakfast spread every morning. We were only there for 2 short days but we felt like it was more because of how relaxed we were. The firepits on the deck were an excellent touch after a long day on the beach. Highly recommend !!!! © 2015 Inn on the Beach. All Rights Reserved.